If you want fun and adventure combined with the security of roots firmly planted in Tulum, Acuatic Tulum is your best choice for scuba, free diving and even snorkeling. The original dive shop in Tulum and brainchild of renowned technical diver Alex Alvarez, Acuatic knows the best dive sites and how to get you there and back safely. Our equipment is new and up to date. Transportation comfortable and reliable. Most importantly our guides know the area, have been instructed at most levels by Alex Alvarez, explorer and underwater cartographer. Too, our guides have your best time on their mind. We work only by reservation with small groups and tailored tours that meet our clients needs. Come to Acuatic and plan an underwater adventure with us. What better way to touch your breath than in a place where you literally register each inhale and exhale. Scuba and free diving: the ultimate pranayama! 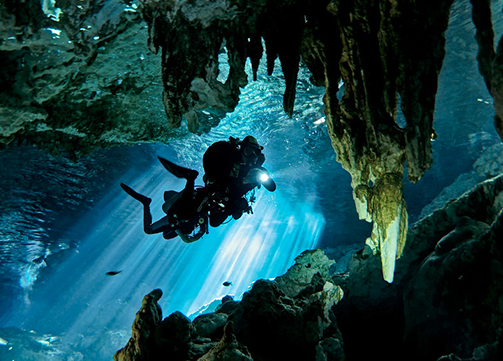 In this magnificent area called the Yucatan, recognized as one of the most popular areas in the world for diving, our caverns help you touch the zen of your being. They allow excellent visibility year round, moderate temperatures, minimal currents with shallow depths of 10 to 25 meters and a beauty incomparable to any caverns in the world. Too, they are easily accessible and within a short distance by car. Guides at Acuatic Tulum are experienced and know the local systems, the best locations and access routes. Some even practice yoga! If you are already a certified diver, we can help you make the most of your diving time in the Riviera Maya. We offer a personalized and enjoyable experience at your level while maintaining your safety. We can also help you if you are not certified. Just ask us how to get better in touch with the breath and the natural environment through a discover dive. *Prices: Two immersion $150 / Three immersions $200 / Price includes all equipment, transportation from the shop, entrance fees, snack and of course the best guides in town! One of the favorite activities for many visitors is snorkeling. Too, snorkeling is a great way to practice for your first dive. If you are not certified to dive, snorkeling in the caverns is the only way for you to experience these amazing systems. And if you like to touch your breath, snorkeling, like diving, helps you appreciate each inhale and exhale. Let us help you make your cenote snorkelling experience happen. Price per person: $75 two cenotes of your choice! Includes mask, fins, wet suit (Cenotes), underwater lamp (Dos Ojos), life jacket (Reef), guide, light snack and entrance fees. All prices are in US dollars and include equipment, transportation and a snack! Need more details? Check out our sister site! More information on scuba diving, freediving, cenote cavern diving tours, reef diving tours, cenote & reef combo tours, PADI courses, Cave & Tech Diving TDI and GUE Training.